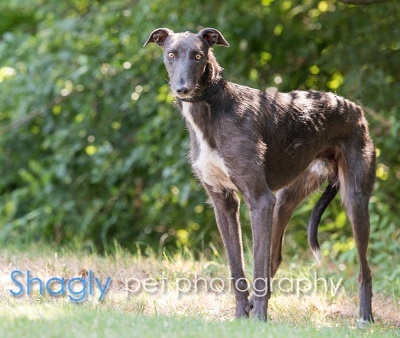 Chance is an approximately 2 year old charcoal black/gray male greyhound mix with gorgeous golden eyes. He was rescued by a good Samaritan after seven months of encouragement and efforts in the Amarillo area. Chance is very shy and hesitant about most things around him. All his medical testing is normal and he has no intestinal parasites, which is very unusual for a stray-especially one that was out this long. Chance passed an initial cat test, but has not yet lived with cats. 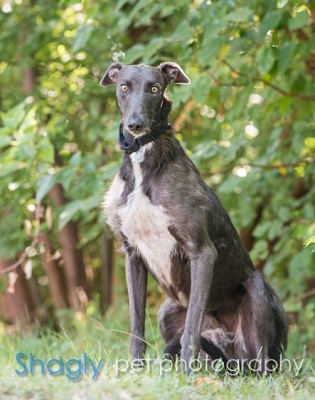 Chance is a very shy handsome boy who is still slowly coming out of his shell. We don’t know his background to fully understand the origin of his fears, though we do know it will continue to take patience to earn his trust and help him be comfortable with new surroundings. Chance does seem to crave the human touch and will come close enough for some petting and bottom scratching when I’m seated. He does startle with sudden movements until he determines there is nothing to fear. He enjoys his food and prefers to eat in his crate with the door closed feeling secure in his surroundings. Periodically he is brave enough to take a treat from my hand, but only if the rest of his pack around him. Chance is very fond of stuffies and has found the toy boxes; he loves to play by himself running room to room with a furry toy in his mouth and he loves to tear them up as well. Chance is housebroken and doing well now that I know his signs to go outside. 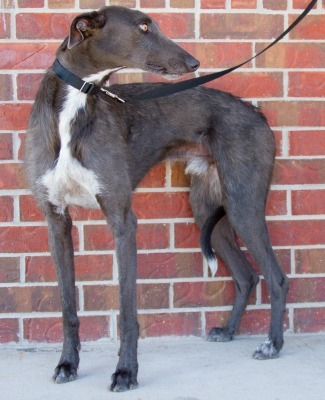 Chance needs a patient and loving forever home with other greyhounds so he can watch and learn from the pack. He is a diamond in the rough and the reward will be to watch his transformation.